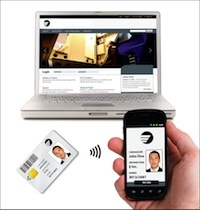 Biometric Associates LP announced the launch of the baiBrowser app that will enable U.S. government officials to access secure Web sites with smart cards on mobile devices. The baiBrowser app enables federal employees to use their iPhones and iPads, along with their government-issued smart card, to access secure web sites and portals that require smart card authentication. The user’s digital certificates that stored on the smart card are displayed on the device and the user can choose the appropriate one, enter their PIN and login. “The secure site can use the smart card to verify the identity of the mobile user and decide to grant access. The actual cryptographic operations are performed by the chip on the smart card,” Smith adds. The iOS version of the app is available as a free download from the iTunes App Store. The Android version is being tested by U.S. Government users and will be available in the Google Play Store in the second quarter of 2013. The baiBrowser app supports both the baiMobile 3000MP Bluetooth Smart Card Reader and the soon to be released baiMobile 301MP attached smart card reader. The baiBrowser app was developed in cooperation with i-DENTITY, a designer and manufacturer of a range of Smart Card Identification Products and components, which include Strong Authentication Mobile applications. Thursby Software offers a similar product, PKard Browser, that supports iOS, Smith adds.